Students in class at the Esperanza Center. Photo by Noah Scialom. Soon after Ana Herrera was born in El Salvador, her parents abandoned her. Her grandmother cared for her but struggled to keep her housed and fed. If the abject poverty wasn’t enough, gangs and violence surrounded her daily. One day, that violence brought her to a breaking point. She witnessed her cousin’s murder by local gang members. Because they knew she witnessed it, she risked being murdered herself. So, she made the choice that countless young people have made in the last several years—she fled. Herrera made it over the U.S. border at Hidalgo, Texas, where she was detained and held in two different facilities for about two months. Herrera had turned 18 prior to crossing the border, so while still very much a young person struggling on her own, she isn’t counted among the unaccompanied minors that have migrated from Central and South America with increasing frequency over the past few years. But like unaccompanied minors, she was immediately thrust into the murky legal waters of the U.S. immigration system. Ana Herrera and her family. Photo by Tanya Garcia. Many of the migrants are families or individual adults, but a substantial minority are young people under the age of 18, traveling alone. Since 2012, over 225,000 of these unaccompanied minors have been detained at the southwest U.S. border. (4) Those numbers started to rise back in 2011 and 2012. In 2012, 24,403 young people were detained and then in 2013, over 38,000. Then 2014 hit, and over 68,000 unaccompanied minors were stopped at the U.S. border. (5) For many organizations that work with immigrants and refugees, 2014 marked the year that the numbers started overwhelming the organizations’ capacity to help. “[The migration] wasn’t catching any media attention before 2014 because [the numbers were] still being managed,” said Kimberly Haynes, the Director of Children’s Services at the Lutheran Immigration and Refugee Service, which is based in Baltimore. Haynes represents the only Office of Refugee Resettlement (ORR) service provider that assists unaccompanied minors through all stages of their care. These youth aren’t sent back to their home countries; rather, they’re sent all over the United States to live with family, friends, or foster households. When they arrive, immigrant-serving organizations and social service agencies are there to help. However, when 2014 hit, those organizations began to split at the seams of their existing capacity. They were under-resourced and under-staffed, and insufficiently able to face the deluge of young people coming with a variety of unique needs, from legal services to mental health support. Immigrant- and refugee-serving organizations such as The Catholic Charities’ Esperanza Center—which provides a variety of services including family reunification assistance, English as a Second Language (ESL) classes, healthcare, and legal services for immigrants—began to feel the effects quickly. Now half of Esperanza Center’s programming serves youth and unaccompanied minors. “When I started here at Esperanza five years ago,” Twanmoh said, “we were serving about 5,000 adult immigrants per year.” They still serve around 5,000 adults per year. But, she adds, “in our fiscal year 2016, we will serve over 10,000 [immigrants] total.” Those additional 5,000 immigrants are kids and teenagers. Esperanza Center isn’t the only organization scrambling to redirect resources to accommodate the surge of unaccompanied minors. The schools and social service organizations around Baltimore, and elsewhere across the nation, have also had to adjust, first in 2014 and then with each wave of new arrivals. Because young immigrants face unique challenges, even organizations that traditionally serve immigrants have had to find new means of support. Most young people fleeing to the U.S. will be detained at the border before being placed in standard removal proceedings. Children are more vulnerable than the adults and families that come across the border, so their cases won’t be expedited. Delaying the cases provides additional time to find representation and support for these kids before they have to sit in front of an immigration judge. To begin the processes of reunification and adjustment, unaccompanied youth immigrants are placed in the custody of Health and Human Services within 72 hours of their apprehension. (6) There, they’ll work with the Office of Refugee Resettlement to identify family members already residing in the United States to whom they can be transferred. That is how many of Baltimore’s child and teenage immigrants arrived. Since the first priority is to get unaccompanied youth into family custody or a safe foster household, the removal proceedings will proceed at a slower pace. But that doesn’t make the legal process any easier. The U.S. immigration system is complicated, opaque and, at times, seemingly contradictory even for a native English-speaking adult, let alone a non-native speaker who hasn’t yet turned 18 and has little access to legal support. Not everyone is so concerned about the prospect of leaving migrant youth without legal representation. Senior Justice Department official and immigration judge Jack H. Weil believes that even a 3-year-old can represent him or herself in front of a judge. As cute as the video is—when asked to state his full name, the boy responds “I don’t know what to do” in a toddler’s high-pitched voice—it pointedly questions the justice of denying unaccompanied children public legal representation. Unsurprisingly, children and teenagers who can afford an attorney, or gain access to pro-bono representation, tend to receive more favorable judgments. One study found that, among unaccompanied minors with legal representation, almost three-fourths (73 percent) were allowed to remain legally in the U.S. For those without representation, the number drops to 15 percent. In 2013, as an increasing number of unaccompanied youth were migrating across the border and landing in Baltimore, Esperanza Center recognized the need for legal aid. They created two positions dedicated to working on legal cases for children, using funding from the Department of Justice’s newly created Equal Justice Works Fellowship program. (11) Morisi got one of the positions. The influx of new immigration cases has impacted the local legal system and its judges. Fortunately, Morisi says, young people in Maryland have great immigration judges overseeing their cases. Most of the cases Morisi and her staff oversee are Special Immigrant Juvenile (SIJ) status cases, which are specifically for children who were abused, abandoned, or neglected. (12) Ana Herrera’s lawyer, Scott Rose—with whom she was connected through Esperanza Center’s legal program—worked with her to pursue SIJ status. Ana Herrera. Photo by Tanya Garcia. Since Herrera’s parents abandoned her as a child, she qualified. Now, just two years after her arrival in Maryland, she is awaiting a green card. Morisi is proud of successes like Herrera’s, but she worries about the kids who fall through the cracks. Esperanza Center recently had a five-month backlog of immigration appointments. Even with three full-time staff attorneys working exclusively with children and a slate of dedicated pro-bono attorneys, it is difficult for them to keep up. To relieve the backlog, Esperanza Center began holding Saturday clinics once a month. At these all-day clinics, Morisi and her colleagues train pro-bono lawyers to work with unaccompanied minors. With the extra hands—and with a dedicated group of volunteer interpreters—they’ve reduced the backlog to three months. Morisi hopes that with more clinics, the wait time will be further reduced. Still, she sees no sign of unaccompanied migration abating. Violence remains high in the Northern Triangle. The youth are still coming. The legal system is merely the first hurdle unaccompanied minors have to overcome. After a child arrives in the United States, they’re shuffled through detention and the beginning stages of the legal system, then they are reunited with family. Even then, the difficulties mount. Youth immigrants have to enroll in school. They have to learn to live with family members they haven’t seen in years, or maybe haven’t ever met. They also have to continue dealing with the loss and violence they experienced in their home countries. These challenges tend to be much more difficult for advocacy organizations to address. They are also often more deep-seated—children and teenagers are frequently left coping with trauma from their past lives while trying to fit into new ones, in a new environment and without much parental guidance. For Ana Herrera, the transition from a Texas detention center to family life was smoother than it is for many others. She was warmly welcomed into her aunt’s household, about an hour outside of Baltimore, and she has adapted well to playing an older sister role for her younger cousins. “The hardest part,” she said in Spanish, “was adapting to the language because many people scoffed because I don’t know how to speak as well in [English]. This made me feel bad.” But by taking classes at a local community college, she has become a more confident English-speaker. Her lawyer, Scott Rose, understands the balancing act between helping a young person tell their story and avoiding re-traumatizing them. No single coping mechanism works for everyone who has suffered from trauma. Every day, mental health providers find themselves trying to support young immigrants who experienced all sorts of hardship in their home countries, many of whom express their pain in different ways. In some cases, the trauma manifests itself in the young person acting out. 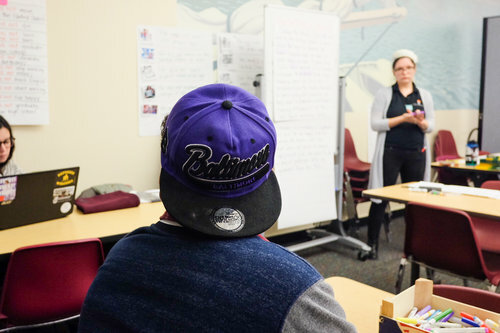 “I can tell you a hundred stories,” said Oscar Mejia, the family care coordinator at Hope Health Systems, which provides mental health, substance abuse, and community support services in Maryland. Many of those stories take place in schools, where young immigrants can struggle to adjust. One story in particular stands out to Mejia. It wasn’t until their fourth session that their story came out. The girls’ mother was imprisoned in their home country because of her gang activity, and rival gang members had killed their father. When their sole caretaker, their grandmother, died, they were living on the streets. The twins’ only option was to journey to their sister in Baltimore, but she had no idea they were coming. As the therapy continued, the twins began to settle into their new lives in Baltimore. Getting to this point, however, takes dedicated support. In particular, public schools—often the first responders to mental health needs for youth—can be ill-equipped, or simply too overwhelmed, to provide that support by themselves. While Baltimore public schools are accustomed to teaching newcomers to the United States, the rise in youth migration strained resources for supporting not only students, but also staff who were effectively called upon to be both teachers and social workers. As the number of Central American students climbed dramatically, Patterson took any assistance they were offered. The school received a part-time social worker. In turn, the state began to put together an English-language task force. While Harris sees improvements at Patterson, she is thinking about what Baltimore ought to do next. For inspiration, she looks to a new schooling model introduced less than an hour to the south, in Prince George’s County, Maryland. For the 2015-2016 academic year, suburban Prince George’s County established two new international schools to support immigrant students all the way to graduation. These schools are designed specifically for recent immigrants who are English language-learners, and they aim to integrate students of diverse backgrounds. (13) Both Harris from Patterson High School and Twanmoh from the Esperanza Center say they’d like to see the model adapted in Baltimore. A pledge on the wall of the Esperanza Center. Photo by Noah Scialom. “We’re similar and different [from traditional schools],” said Alison Hanks-Sloan, principal at the International School at Largo in Prince George’s County. The international school model is designed not only to provide a collaborative and team-oriented learning environment, but also, with the help of a full-time social worker and a team of interns, to provide the mental health support that many youth immigrants need. This holistic model is designed to create a strong sense of community and belonging for many of these kids, by having them work in teams made up of different capacity levels. Instead of lecturing to the class, teachers act as facilitators, helping their students teach one another. While the ultimate goal is to get these kids to graduation and then to a successful career or education path thereafter, Hanks-Sloan has seen early success in their initial class of first-year students. The two International Schools serve only a small percentage of the immigrant students in the Prince George’s County school system, but it’s a start. And it’s a model that, if adapted in Baltimore City, could one day work side-by-side with organizations like Esperanza Center, Hope Health Systems, Behavioral Health System Baltimore, and Patterson High School, all of which are working hard to make Baltimore a safer haven for immigrant youth. This is the kind of story that the teams at Esperanza Center, Baltimore City Public Schools, and Hope Health Systems love to hear. Herrera’s story is an inspiration for those working with young immigrants, especially in the moments where there seems to be little hope. For Oscar Mejia at Hope Health Systems, Herrera’s story is the kind he wishes for all of the kids he works with. He sometimes remains troubled by the serious obstacles facing these young people. In conversation, he mentions a 14-year-old student who was cutting herself regularly. During one of their group sessions, she opened up about it, and other students revealed that they were doing the same thing. Successes like these pull Mejia and the staff at other immigrant-serving organizations through the challenging moments of their work. They know success is possible for youth immigrants, and they know they can help these kids achieve it. JEFM V. LYNCH-DEPOSITION OF HONORABLE JACK H. WEIL, ACLU (Oct. 15, 2015); Can a 3-year old represent herself in immigration court? This judge thinks so, Washington Post, Jerry Markon (March 5, 2016). When I put the maps thrown out by the courts in front of them earlier this year, I found in my students a fresh, unwilted idealism that rejects, intuitively and forcefully, practical arguments that try to explain away gerrymandering. Henry Montgomery was arrested when he was 17 for a crime he may not have committed. 52 years later, he's bringing his case before the U.S. Supreme Court on Tuesday, Oct. 13th.